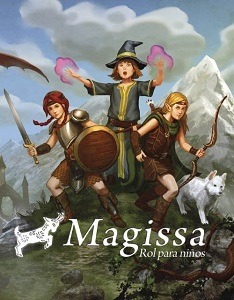 Magissa is a game designed to be scalable so anyone from about any age can play. Advertised as “Role for children”, it promises a lot, but does it deliver? Magissa was published in 2015 by Spanish publishing company NoSoloRol. At the time of writing this review, there is no English edition. It’s hard to say why, but children today are, or seem to be, a lot less interested in getting into fights with Goblins, Orks or to tame Dragons. At least that is what many RPG publishers will tell you considering how few RPGs for kids are sold and how hard it is to sell those that do sell. Many questions can be asked but the main one is “why?”. However answering that question is not the purpose of this piece. To tell you what Edana Patsaki and Fernando Real have done about it is. The book is a landscape bound small book, full colour and hard cover with over two hundred pages of information. And it feels very heavy in my hands. It is actually very nice to handle, even though I usually don’t favour landscape binding. The cover illustration perfectly reflects what the book is trying to accomplish: Children as fantastic characters running adventures in a fantasy world. Everything about the image is right. From the composition to the colour palette, the whole image feels just right for this book. Layout is well done, though I know of a few people who would probably complain about the parchment texture. A three column format with fairly small text makes the book easy to read enough, though the font used for the titles are hard to read and in some places, like the spells in the magic section, the subtitles are too close to the spells and it makes it hard to know where one ends and the other starts. Illustrations vary from excellent to merely acceptable throughout Magissa. Generally they do the trick in terms of providing a good visual reference and being attractive at that. Even though the quality of some of them is somewhat lacking, especially compared to other ones, the book can’t be blamed for having bad artwork. Before I go into character creation and the rules system, I must point out that the language the book has been written with also has been thought out to reflect that informal nature of the game and emphasize who are the target player: Children. Even though the book has been written for adults, the aim firmly remains to play with kids. The rules are fairly simple, though the system tries to have a sliding scale of complexity and it allows, or tries to, you to play with FATE dice, d4, d6, d8, d10 or even d20 (no, I haven’t forgotten the d12). The core mechanic is just roll a number of dice and count the successes and the player with the most successes wins. You can also add advantages and disadvantages (which give you, or takes away dice) to make things more interesting and encourage to use secondary skills or the environment. Through the whole book, the authors keep giving explanations on how to use advantages and how to change the type of dice you can use for each age bracket. A suggestion of d4 for younger children i advised, with a sliding scale for older children and thus go up to d6 and d8 as the average, or go higher to d10 or even d20 for harder odds and more challenging play. Character creation has also been designed so younger players can have simple characters with less attributes and abilities, and older players can have fuller characters with more complex abilities, spells and skills. The playing characters are Human, Dwarf, Satyr, Child-cat, Centaur, Faun, Elf and Unicorn. Each one of them has their own advantages and backgrounds, with some classes suggested for each. For example the child cat is more geared towards being a Rogue whereas the unicorn is more geared towards being a wizard or a healer. The standard attributes and skills are present in the game. From Strength to dexterity or charm. The choices are to play the character with four or with five attributes. The younger the player, the less attributes they use. Professions are not original either, it has to be said. Fighter, Wizard, Rogue, Healer, and Explorer. However we have to remember we are playing with children and they will do because using complicated and obscure professions doesn’t really serve to make the game better. The next part of the book, which is pretty much half of it, is something that more role playing games should do: devote time and space to teaching how to play the game and how to run it. Over two chapters, the authors go on to explain the basics of running games for children to how to run games for educators without making the game boring. From how to organise adventures to storytelling, the description is comprehensive enough to give people more than a good idea about how to play. And, more importantly, how to play with children. A small bestiary with the typical creatures – goblins, wolves, trolls, dragons… – gives a bit of food for more adventures. Although limited in its scope, it is large enough for beginners and children quite a lot to start with. Lastly, a world description and some adventures conclude Magissa. The world is pretty interesting with a flat(ish) shape, a central continent surrounded by an ocean and a periferic outer continent, more dangerous and less described, which is a good ground for exploration as the children grow up. Magissa is a book that is advertised in somehow the wrong way. The cover of the book says “Roleplaying for children” when in reality it should say “Roleplaying with children”. Although the whole book is rather excellent, I wouldn’t give this book to a 12 or 1 o years old child. The complexity scaling with dice, character creation and rules make this game soa bit unsuitable for younger kids. It could be very easy to become confused and not know what rules to use, or how to apply them fully. However, once you understand Magissa is for adults to be able to play with children, the whole thing changes and this game excels at it. The language it has been written in, although childish in places, it helps keep the whole experience for kids, which is exactly what it should be. Plenty of examples throughout the book provide with much needed clarification for rules and systems, like combat and character creation. The art direction, though lacking in places, is cohesive enough and some of the illustrations are really fantastic. The layout has some minor issues that probably won’t take much to amend in future editions of the game. The thing that makes this book shine is the sheer amount of information for new GMs and how thorough and seriously the authors take the approach to gaming with children. The authors perfectly understand the positives of RPGs and do their best to ensure the reader gets the best possible start whilst keeping in mind all the time that the game is meant to be for children, not for adults. By now it should be clear that I think this game is excellent and if you want to get your kids, or anyone else into RPGs, this book will give you a very good starting point. Now we just need a version in English. NextPodcast Episode – The RPG Room: Be kind to your GM.